Quickly find good movers and packers Mathikere Bangalore for fast and secured local home relocation within Bangalore. 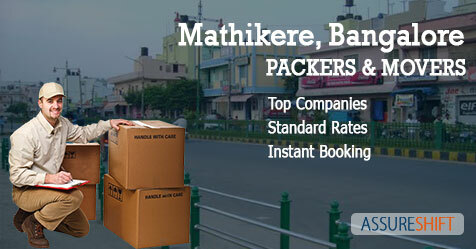 Packers & movers from Mathikere and nearby areas, serving Mathikere locality are listed here. Packers and Movers Mathikere are all registered GST service providers, you can trust on. Just tell us your shifting requirement and we will recommend you 3 best match service providers within minutes. Directly connect with top packers and movers in Mathikere Bangalore compare best mach service providers from our reference or find the right fit by yourself. When you book anyone without AssureShift’s knowledge it will be your responsibility to cross check the relocation service professional. Mathikere is located in north Bangalore close to Yeshwanthpur, Malleshwaram, Armane Nagar, Sanjaynagar, R.M.V. 2nd Stage, and Jalahalli. Yeshwanthpur is hub for transporters and you can get good service providers at good price. Here packers and movers from Mathikere and nearby areas serving in Mathikere are listed. They are verified and 100% safe for local household shifting or domestic relocation. View list of all local packers and movers in Bangalore for getting a broad idea. Shifting to a new home in neighbourhood itself is tedious and time consuming task. You have to take care a lot of things to make it quick and successful. Where experienced moving companies can help you in complete shifting of all your goods safely at doorstep. You don't have to worry about a thing, they will handle it all packing, loading, unloading, and final placement of your items from start to end. Our reliable local packers and movers from Mathikere will help you in local household or office shifting. Relocate to a new home with ease movers and packers Mathikere will handle it all door to door pickup and delivery. Want to move outside Bangalore to any other city in India, take professional and reliable services from our national home relocation service providers and deliver all your belongings safely. Whenever hiring a relocation service provider its better to compare at least 3 options. There are many packers and movers in Mathikere, but all can't deliver you the same result. When you submit you requirement at Assure Shift you get 3 best match recommendation according to your requirement, so you can choose the best movers and packers Mathikere Bangalore in shortest time.